The RocketPort 550 Universal PCI family delivers RocketPort reliability in a 16550 UART based serial card. 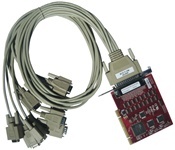 Designed to be fitted into either a 5.0Volt or 3.3Volt PCI-bus interface, with low profile options, the products offer a variety of connector options and models supporting from 4 to 16 serial ports. The RocketPort Universal 550 provides a low-cost serial expansion solution that delivers the highest performance and reliability through industry standard 16550 UART technology. Hardware interrupts Each card requires one system IRQ.